Hundred years since the Bolshevik Revolution, we live in a world in which patriarchy directly continues to constitute class. The patriarchal family remains the foundational unit of organization of both the class basis of property and propriety and is constituted by all other graded inequalities – be it caste, race or religion. The edifice of bourgeois constitutionalism and law stands on the sanctimony of private property defined by ‘family law’ – the ultimate sanctum-sanctorum of the ‘private’. And in the propagation of this uncontested domain of rarefied knowledge, there is erasure of memory and history of the significance of the Bolshevik Revolution in the chronicling of the myriad struggles against patriarchy, oppression and exploitation in and since the 20th century. In the nineteenth century women experienced a backlash in the protection from sexual and domestic violence which was connected to new attitudes towards femininity and masculinity. Associating normative sexual behaviour (chastity) with the notion of honour and moving to the protection of honour rather than staying with the protection of a person, excluded many women from the distribution of justice. Only those women who conformed to the prescribed standards of femininity could find justice. Domestic abuse, although it became a marker of ’low-class’ behaviour, and was disapproved by official and public discourses, continued to serve as a means of control. Yet it became invisible and withdrawn into the sphere of intimate spousal relations among upper classes, making it extremely difficult for women to ask for legal protection. The transformative aspects of Bolshevik efforts did not lie only in the attempted change in the institutional zone of production and appropriation of surplus and by extension the potential and limits of ‘growth of productive forces’ which has been the focus of debates on socialist production and transformation. It lay in the re-conceptualisation of the radical transformation needed in the sphere of social reproduction to annihilate patriarchy, oppression and exploitation. That collectivisation of production and abolition of private property rights played an important role in the Soviet Union, in raising new standards in food, health-care, housing, education and clothing and providing women visibility and better remuneration as workers is acknowledged. However, the other foundational transformation in the formulation of socialist family codes in the ‘conceptualisation of revolution within the revolution’ is hardly dwelt upon in accounts of the Bolshevik Revolution. 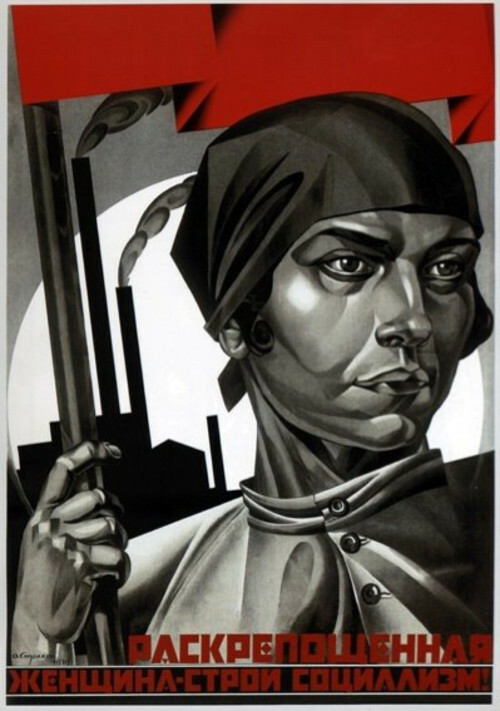 This article focuses on the developments between 1917 and 1923 in its attempt to put the question of social reproduction as central to the revolutionary project of the Bolshevik Revolution. Smidovitch in 1926 wrote in an issue of the Kommunitska that Innessa Armand, in the conference of Women Workers in 1918 as a leader of the Zhenodtel held that ‘separate households are harmful survivals [of the bourgeois order] that only delay and hinder new forms of distribution’. She was not alone. The period of war communism was seen by P I Stuchka, the first People’s Commissar of Justice as a plan for ‘the free family of the future when the family’s role as a cell of production and consumption, as a juridical entity, as a social insurer, as a bastion of inequality, and as a unit for feeding and bringing up children would all disappear’. The Decree on Land on 26th October 1917 was followed by the first decree on marriage and divorce in December 1917. The law on ‘Land Socialization’ followed in February 1918 and then came the first Family Code in October 1918. These were the precursors to the 1922 Land Code. The sequence, pace and formulations of these legislations show that the abolition of semi-feudal and semi-capitalist private property rights was hinged on the question of reorganising social reproduction and its relationship to reorganization of production. It became the key question in terms of not only the quest for emancipation but also the survival of the peoples of the Soviet Union right after the revolution in the face of hostile imperial geopolitics. The Bolshevik effort to reorganise social reproduction in the time of ‘War Communism’ way beyond the insipid tenets of welfarism had been the greatest promise of revolutionary emancipation from patriarchy and social oppression – i.e. from the tyranny of family, private property and the state. This conscious political attempt was informed by collectivism rather than individualism forming the basis of what Marx had conceived as new ‘individualities’. In view of the need to encourage the development and growth of feelings of solidarity and to strengthen the bonds of the work collective, it should above all be established that the isolation of the “couple” as a special unit does not answer the interests of communism. Communist morality requires the education of the working class in comradeship and the fusion of the hearts and minds of the separate members of this collective. The needs and interests of the individual must be subordinated to the interests and aims of the collective. On the one hand, therefore, the bonds of family and marriage must be weakened, and on the other, men and women need to be educated in solidarity and the subordination of the will of the individual to the will of the collective…it does not recognise the couple as a self-sufficient unit and does not therefore approve of wives deserting work for the sake of this unit. The stronger the collective, the more firmly established becomes the communist way of life. The closer the emotional ties between the members of the community, the less the need to seek a refuge from loneliness in marriage. Under communism the blind strength of matter is subjugated to the will of the strongly welded and thus unprecedentedly powerful workers’ collective. The individual has the opportunity to develop intellectually and emotionally as never before. In this collective, new forms of relationships are maturing and the concept of love is extended and expanded. In October 1918, the attempts at reorganizing social reproduction were formalized in the Code on Marriage, the Family and Guardianship. The code according to Goldman was an attempt to ‘capture in law a revolutionary vision of social relations based on women’s equality and the ‘withering away’ of the…family’. The authors of the Code saw it as preparation for a time when the ‘fetters’ of ‘husband and wife’ would become ‘obsolete’. The code was formulated with the idea that the progress of the revolution would make the code redundant i.e. the aim of law was to make ‘law superfluous’. The attempts in the USSR in its early phase started with the decriminalization of homosexuality in 1918 and the conscious cultural attempt to create conditions for breaking the structures of the sexual division of labour through the Family Code of 1918 to break away from the unit of organisation of society in terms of the reproduction of the patriarchal monogamous family. The Code established legalized abortion, facilitated divorce at the request of either spouse without requiring any ground. It abolished ‘illegitimacy’ and entitled all children to parental support. It gave legal credence to ‘collective fatherhood’. Children and women were the locus of the legislation. The most important feature of the code was that marriage did not create joint property between spouses: a woman retained full control of her earnings after marriage, and neither spouse had any claim on the property of the other. This code became more and more difficult to operate and by 1926, the new family code did away with ‘collective paternity’, recognized the need for protection of women after divorce and legalised adoption into the family. The material contradictions which led to the changes to the code in 1926 were evident by the early 1920s. This was indeed the most difficult of the difficulties the revolution faced in its attempt of envisioning of the new socialist society. Trotsky in July 1923 in an article in the Pravda captured the material contradictions of this attempt. A radical reform of the family and, more generally, of the whole order of domestic life requires a great conscious effort on the part of the whole mass of the working class, and presumes the existence in the class itself of a powerful molecular force of inner desire for culture and progress. A deep-going plough is needed to turn up heavy clods of soil. To institute the political equality of men and women in the Soviet state was one problem and the simplest. A much more difficult one was the next – that of instituting the industrial equality of men and women workers in the factories, the mills, and the trade unions, and of doing it in such a way that the men should not put the women to disadvantage. But to achieve the actual equality of man and woman within the family is an infinitely more arduous problem. All our domestic habits must be revolutionized before that can happen. And yet it is quite obvious that unless there is actual equality of husband and wife in the family, in a normal sense as well as in the conditions of life, we cannot speak seriously of their equality in social work or even in politics. As long as woman is chained to her housework, the care of the family, the cooking and sewing, all her chances of participation in social and political life are cut down in the extreme. Trotsky constructed four typologies of the contradictions within the family that emerged in the realm of the ‘private’ domain of the family as the old structures of production-reproduction started breaking down. Kollontai’s extensive writings and especially her serialized essays in the Kommunitska dwell in great detail on this contested and conflictual relationship between the new social organization of production and the family as the site of social reproduction. But it is in her fiction ‘Red Love’ in 1921 and ‘Great Love’ in 1923 that she underscores the contradiction of this material dialectic of the Revolution pointing to the emergence of a hierarchical technocracy with the adoption of the ‘New Economic Policy’ in 1921 and the way in which it was reconstituting the social basis of patriarchy. Significant questions have since then been raised about socialist experiments in terms of the creation of a hierarchical technocracy that had its inherent class logic that ‘assumes people on the top are the only real subjects of creating new society and the capitalist objectification of the worker continues to remain in the process of carrying out commands down the line’. But even more fundamental to the process of social restructuring was the problem that while the old appropriators of the surplus had been done away with in the course of the revolution, the producers of the surplus were not the owners of the surplus. This production of the surplus while geared towards the end of a better material life for all, had to fundamentally address the question of not only the wage-surplus relationship but also the sexual division of productive and reproductive labour in the determination of this relationship. The relationship between the collective enterprise system and the family that the New Economic Policy entailed, has been the twin locus of determination of the wage-surplus relationship in the organisation of societies attempting social transformation in which the sexual division of both productive and reproductive labour has paid a pivotal role in a. the determination of the wage-surplus relationship itself b. making the social basis of patriarchy mutable in progressive ways but reversal of that mutability in the face of crises of production and/or reproduction by creating the possibility of shifting the burden of social reproduction at least cost by mobilizing coercive unpaid labour through patriarchy and other modes of social oppression in the realm of the ‘hidden abode of reproduction’. A century later, as we commemorate hundred years of the Bolshevik Revolution, it is important to recognize that the shift in priority to the growth of productive forces as the focus of extensive transformation (irrespective of whether it was historical compulsion or historical choice) rather than egalitarian institutionalization of social reproduction was the biggest challenge that the revolution faced after its first five years since it embarked on the most radical attempt in world history to annihilate patriarchy, oppression and exploitation. Chirashree Dasgupta is Associate Professor at Jawaharlal Nehru University, New Delhi. Roy, Mazumdar and Das Gupta, Mimeo, 2015.